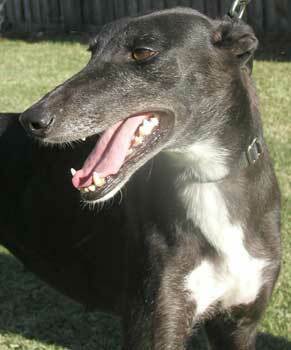 Pyper, aka HyperFeet, is a gorgeous 4-year-old black girl with a stunning white chest blaze, born July 2, 2000. 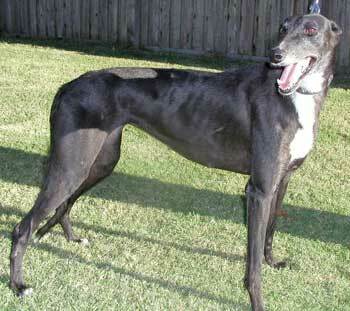 Pyper's dam is Flying Bulger and her sire is Cee Jay. Her racing name correctly describes her activity on the track, as she raced mainly as a Grade A racer at the Wichita, Kansas track but it certainly does NOT describe her personality! She is very people oriented and extremely affectionate, and considers herself to be a "lap dog"for sure! She will put her paw in your lap, and would certainly crawl up to snuggle if given the opportunity! Pyper is small animal and cat tolerant.